In response to President Cyril Ramaphosa’s call on all South Africans to take charge and clean up their living environment, KZN MEC for Cooperative Governance and Traditional Affairs (Cogta) Nomusa Dube-Ncube has, in the presence of national Ministers of Cogta Dr Zweli Mkhize and Environmental Affairs Nomvula Mokonyane, Deputy Minister of Cogta Andries Nel and KZN MEC for Health Dr Sibongiseni Dhlomo, today launched “Good Green Deeds” in the Pietermaritzburg CBD. 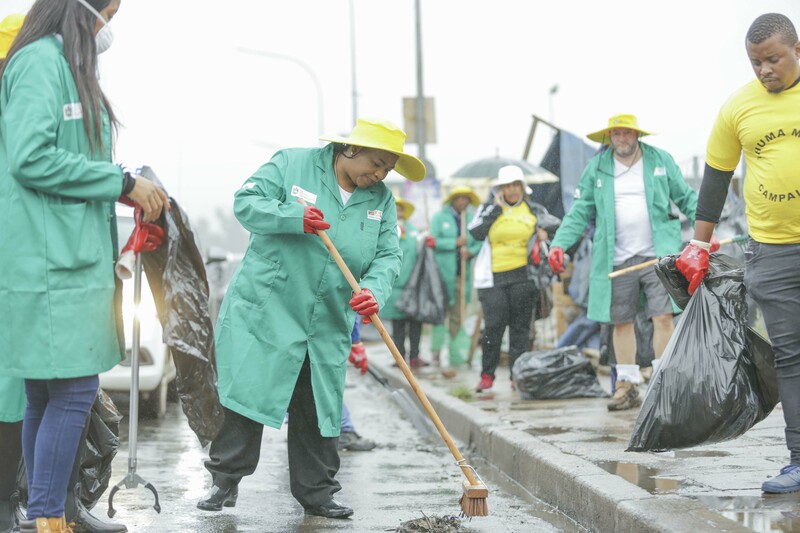 “Today’s massive clean-up campaign, which will be rolled out to the rest of KZN, has been designed to clean up sidewalks and storm drainage and cut grass and verges. It will also address illegal trading, law enforcement, by-laws transgressions and illegal posters, as necessary. We have made a good effort in Pietermaritzburg CBD this morning with the help of dozens of government and municipal officials,” said Dube-Ncube who personally joined one of the clean-up teams. Today’s launch commenced early with the unveiling of millions of rand worth of yellow plant equipment which is destined for municipalities which have been hiring such equipment for local clean-up operations at enormous cost. The newly purchased equipment will help in cleaning drains, rebuilding infrastructure and improving the general environment in KZN’s municipalities, many of which have struggled with general cleanliness. The equipment include: 16 x TLB, 11x Graders, 15 x Water Tankers, 18 x Rollers, 19 x Honey Suckers, 6 x fire trucks, 1 x long base fire engine totaling R104 million. “In addition to clean-up operations in the province’s municipalities, the government will also take steps to ensure that citizens are informed when their grass will be cut, refuse collected and environment cleaned. We are pleased to report that many businesses are already showing enthusiasm and promising to avail their staff, adopt a spot to clean regularly and donate equipment for this province-wide clean-up campaign,” said Dube-Ncube.